Presidio Goliad Wildflowers - After a few years not having wildflower the Presido La Bahi had some when we came by. This cloudy spring day made for a nice backdrop of this historic site with these great texas wildflowers. 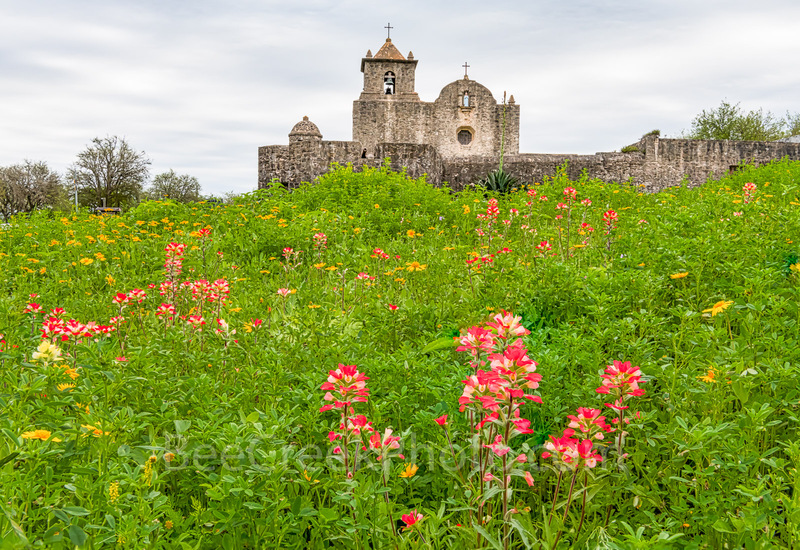 So we capture the Presidio La Bahí in Goliad on a spring day with texas wildflowers growing in front. There was a mix of texas wildflowers including indian paintbrush and some yellow daisy like flowers through out this field of flowers in front of the church. We also saw some bluebonnets, salvia and phox while there. The history of the Presidio Nuestra Señora de Loreto de la Bahía, known more commonly as Presidio La Bahia, is a fort constructed by the Spanish Army that became the nucleus of the modern-day city of Goliad, Texas, United States. Fort Goliad as it was called has been the home of the spanish, mexicans army and the was part of the Texas rebellion. There has been a long history with the battle of Golida when Fannin and his 300 men were capture and executed by mexico. The tragedy at Goliad would be used to recruit new soldiers into the Texas Army and the cries of Remember Goliad would assist in Santa Anna's defeat at the Battle of San Jacinto one month later. This fort was orginally founded in 1721 on the ruins of the failed French Fort Saint Louis, the presidio was moved to a location on the Guadalupe River in 1726. In 1747, the presidio and its mission were moved to their current location on the San Antonio River. By 1771, the presidio had been rebuilt in stone and had become "the only Spanish fortress for the entire Gulf Coast from the mouth of the Rio Grande to the Mississippi River". The civilian settlement, later named Goliad, sprang up around the presidio in the late 18th century; the area was one of the three most important in Texas,. Photo © copyright by Bee Creek Photography - Tod Grubbs / Cynthia Hestand.